1. 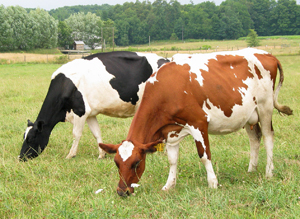 Feed the dairy herd pasture, dry hay and (in a dry year) baleage for five to six months per year. Calves are the only animals getting grain during this time. 2. Grow no corn, buy no corn, feed no corn to milking animals. Invest nothing in corn-specific equipment or infrastructure. 3. Employ a few daily pounds of barley baleage, harvested at dough stage, to balance energy and protein needs for six to seven months of total and partial confinement feeding. Harvest and store the barley with your hay making equipment, and employ a vertical mixer in feeding it. 4. Put most of your crop management effort into producing as much high-quality pasture and hay/baleage as possible. Purchase no protein supplement. 5. Ship more than 14,000 pounds of milk per cow from a Holstein/Ayrshire/Swedish Red-cross herd, with butterfat at 4.0%, protein near 3.1%, and a somatic cell count a bit above 100,000. 6. Calve 90% of the herd from late winter through late spring. 7. 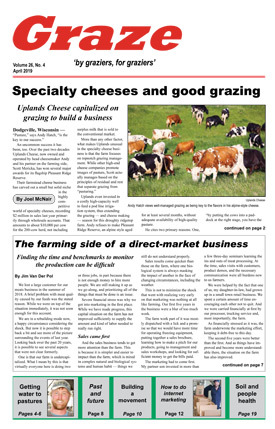 Feed a 40-cow milking herd and replacements from 137 acres, and have some hay to sell most years. 8. Spend about $85 per cow on purchased feed, including salt, minerals and kelp, plus the calf starter. 9. Smile when the numbers on the organic milk check dwarf those printed on your bills. This is Amos Nolt’s formula, and he plans on sticking with it for a while. Never a heavy feeder of supplements, Amos is in his third year of going without grain during the pasture season, and without corn year-round. Theoretically, a pound of corn fed at such low levels should yield at least two pounds of milk. But Amos says he wasn’t seeing such results. Back when his herd was primarily Holsteins consuming a lactation average of 10 lbs. of corn per day, the herd peaked at about 16,000 lbs. of milk. As organic corn prices increased, Amos cut the ration back to six pounds. “I told my supplier that if corn goes to six dollars, then the corn can go to pigs and chickens, because I wasn’t going to feed it,” he relates. Organic corn did reach that mark, and for the first 10 months of 2005, Amos says the herd “got along just fine” without any grain at all. Feeling that some additional energy was needed, Amos started feeding barley baleage in the winter of 2005-2006. Under the new feeding regime last year the herd, now with a large proportion of Ayrshire blood, averaged 14,200 lbs. of milk shipped, with 570 lbs. of butterfat and 438 lbs. of protein. Compare that to the Nolt herd in 2001, which had far more Holstein genetics and was being fed a lactation average of 10 lbs. of organic corn/head/day along with some protein offered in winter. Those cows averaged 15,048 lbs. of milk sold, 588 lbs. of fat (3.9%), and 440 lbs. of protein (2.9%). 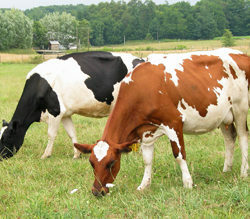 (In both years, the herd was milked three times a day for about three weeks in early lactation.) The 2001 production record came with a purchased feed cost near $500 per cow, or more than five times the 2006 feed bill. While this year’s dry weather and a failed experiment with growing spelts has hurt production a bit, Amos is confident that a 14,000-pound herd average from cattle with about the current genetic profile is easily attainable over the long term. With Swedish Red-cross heifers doing well this year, “I am very confident that I can achieve 15,000 pounds again,” Amos says. While not spectacular, this production level is probably close to the norm for organic dairies, most of which are spending a lot more money to feed their cows. “I am 100% sure I am not losing one single pound of milk by not feeding corn,” he asserts. The herd average is helped a bit by the fact that Amos culls an average of 25-30% of his herd each year, almost all them sold as dairy animals. Most of these cows are lower producers in his system. Such a strategy demands topnotch forage management. Milking on this farm since 1996, early on Amos relied heavily upon perennial ryegrass/white clover swards. The 40-cow herd grazed three-acre paddocks on 24-hour intervals in a 14-day rotation. Primarily in grass before the Nolts arrived, this is a well-developed grazing farm with high organic matter soils. Still, summer ryegrass performance was poor, so Amos lately has been tilling and replanting equal amounts of ryegrass, orchardgrass, timothy and reed canarygrass in a 20-pound mix, along with six pounds of white clover. Amos likes to see a 40% clover population in the stand, and tries to lime every four years no matter what the soil test says to promote clover and no-grain milk production. About 80 acres are in pasture. Instead of giving the cows the entire three acres right away, he now splits the paddocks with temporary wire to offer two acres during the daylight hours, and removes the wire to provide the remaining area at night. Amos says this has promoted more even grazing and reduced his clipping requirements. Clover stands have improved since he went to a 28-day rotation, Amos says. Harvested forage also gets plenty of attention here, with dry hay balancing pasture, and baleage wrapped in in-line tubes fed largely in winter, late fall and early spring. Amos doesn’t test his forages, instead relying on his experience for estimating protein content. He has been making a greater effort to cut hay earlier. “I definitely make better hay now,” Amos says. The 50 acres devoted to hay production are dominated by red clover. Amos says he saw improved cattle performance when he switched over from alfalfa years ago. Most years through the grazing season, cows are eating about 10 dry matter pounds of dry hay to supplement an estimated 30 pounds of pasture dry matter intake. With a moderate drought in effect this July, 20 pounds of third-cutting baleage from last year was being substituted for the pasture. During the pasture season the milking herd has been offered salt, kelp, sodium bicarbonate, and a mineral/di-cal mix, although Amos says only the salt mix gets eaten in any quantity (he stopped feeding the mineral/di-cal mix late this summer, and was questioning his $10/cow annual kelp expenditure). Chicken manure is another key to making this organic system work. Amos invested in a contract broiler barn on the farm that annually finishes six batches, each with 25,000 birds. He says the barn provides a decent return on the investment while requiring about an hour of daily labor. With area poultry producers hiking prices for their litter, Amos can also count some fertilizer savings as a benefit. He applies two tons per acre to his fields, normally about half from piles and half raw. Pastures usually get two applications timed to stimulate grass growth, one in mid-summer and the other in early fall. Amos tries to apply the litter shortly after the cows have grazed the paddock and hopefully just before a rain. He hasn’t seen any rejection when cows return to these paddocks four weeks later. The chicken litter also provides a boost to his hayfields and annual cropping ground. For instance, Amos says he can harvest 18 bales of 45% moisture barley baleage per acre with the manure, and probably just 10 without it. Six acres of barley is enough to feed the dairy herd for up to seven months. The barley comes off in early June at dough stage testing at 8.5-9% protein, and he has planted sorghum-sudangrass for a late-season baleage crop, although he’s looking at trying something of higher quality next year. Since wet barley attracts flies, Amos aims to open a tube no earlier than October. This also serves to dilute the excess protein while making up for energy shortfalls in fall pasture: Amos said his 2006 barley crop had a Brix reading of 20 at harvest. Indeed, what sold Amos on barley was seeing an unprecedented spike in milk solids when he started feeding it in the fall of 2005. During the feeding season, the amount of barley in the mixer will vary from three to 12 pounds (as-fed basis), with the ration fed on a covered, drive-by apron in front of headlocks along one side of the bedding pack barn. Barley amounts generally increase proportionally with baleage quality. While the technical rationale is to balance the milk cow ration at around 16-17% protein, the practical matter on this farm is that it’s all about the cow pies. He believes that too many dairy farmers are afraid to manage their cows by such visual observations. “Farmers are taught that feeding cows is computer science that requires the help of dairy nutritionists. There’s a lot more money that could be made on the farm if the farmers weren’t so afraid to feed their own cows,” Amos asserts. Barley is taken away from the cows at dry-off, and is returned to the ration about a week before calving. Amos aims to feed his best baleage in early spring to encourage as high a milk production peak as possible. Last spring he learned a lesson about the importance of good early lactation forage when baleage supplies ran short because Amos had grown some spelts on what otherwise would have been hay ground. He didn’t get the spelts off at the right time for forage purposes, so it wasn’t dairy quality feed. He opted not to spring for expensive organic soymeal, so milk production suffered. The herd peaked at just 60 pounds, or at least 10 pounds below what Amos thinks he should attain from good forage balanced with barley. Amos closes the barley tube in early May when warm weather returns. Ideally he would continue feeding some grain through the spring flush to balance the high-protein grass, but he feels that would require going to individual bale wrapping to retain quality in warm weather. Amos owns one-fifth of the in-line wrapper, he isn’t willing to invest in another wrapping system, and he doesn’t know of anyone in the area who will wrap individually on a custom basis. For now, at least, dry grassy hay fills the pasture-balancing bill. The other major benefit to barley is that Amos did not need to buy any equipment to grow it, harvest it or handle it. His haying equipment does the job and, while the investment in his vertical mixer and bale unroller added up to about $25,000, such equipment would be required for many feed mixing programs. The result is an annual purchased grain and salt/mineral/additive bill around $85 per cow, with more than half of that cost attributed to the $1,800 of starter feed for about a dozen calves each year. Compare those purchased feed costs to revenues of more than $3,000 per cow, and you can understand why Amos Nolt’s formula might look attractive to an organic grazier who is disappointed with the percentage of the milk check that is disappearing off the farm.